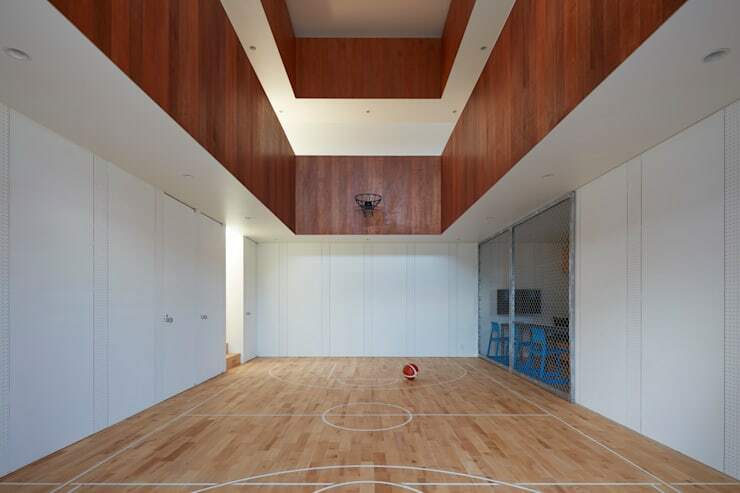 The ground floor of this unique Japanese home is almost entirely devoted to a large basketball court. It's possibly the perfect choice for a sports-mad family. After all, team games are a great way to keep a young family engaged with each other, not to mention fit and healthy! But the basketball court is more than just a place to play. The architects, Koizumisekkei, have designed the court to help resolve one of the rather common challenges of the building site. But before we give too much away, come with us on a photo tour of this unusual family home. Enjoy! 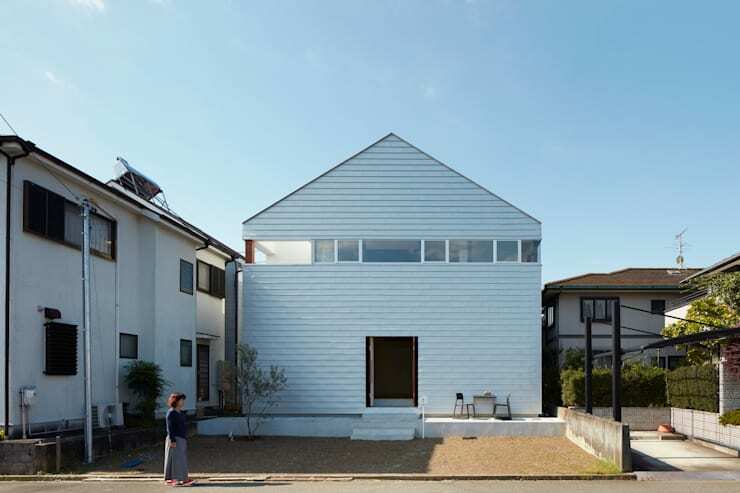 The two-level family home has wooden cladding, a peaked roof and white exterior. It is located in a fairly dense city location and suffers from a potential lack of privacy. But the architects have resolved this issue by completely omitting windows from the ground level. Instead, we have a high and narrow band of windows that run the entire perimeter of the house. It protects the occupants from the intrusion of prying eyes and floods the interior with abundant light. In all, the window choices together with the complete lack of ornamentation give the home a modern, minimalist feel. On entering the home, we come to the main ground level living area and indoor basketball court. The height needed here allows the architects to create a large, central opening to the upper levels. This is a great feature that allows all the light from the upper-level windows to flow down and throughout the space. 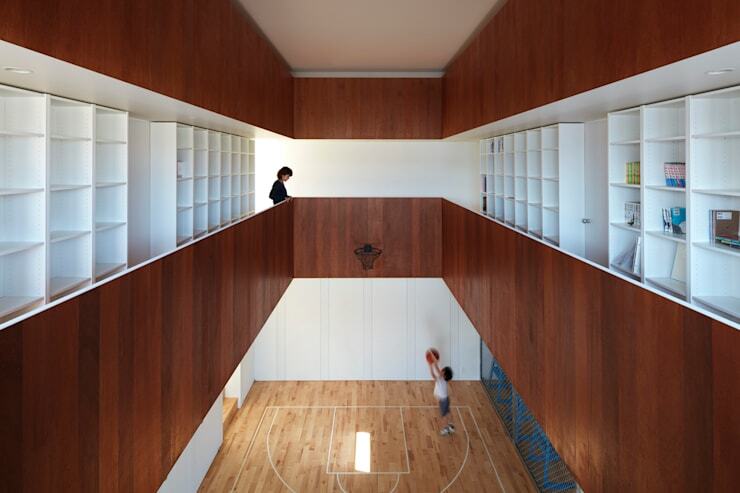 Finally, the unusual addition of a basketball court is softened somewhat by the expansive use of wood on the floor and upper levels. There is also a sliding cage door on the right to protect and separate the kitchen area. The upper level has vast white open storage units. The design of each open unit is fairly standard, but the simple white decor and vast expanse of these features add a certain geometric beauty to the home. This is emphasised by the striking parallel lines of wood seen here. Note how the ceiling has been lowered to create the wooden band that runs parallel to the walls of the walkway. 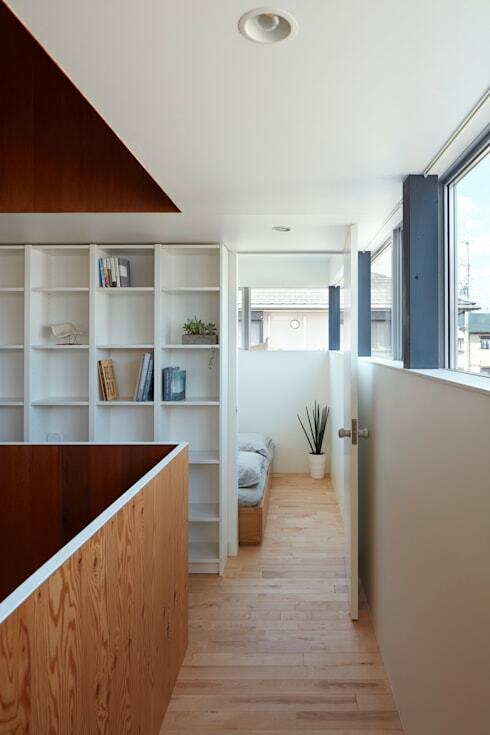 Many Japanese architects have embraced the raw quality of industrial materials and minimalist designs. Here we have a good view of the minimalist and rather industrial-style kitchen. It has simple wooden cupboards, an aluminium kitchen bench and simple iron storage cabinets. 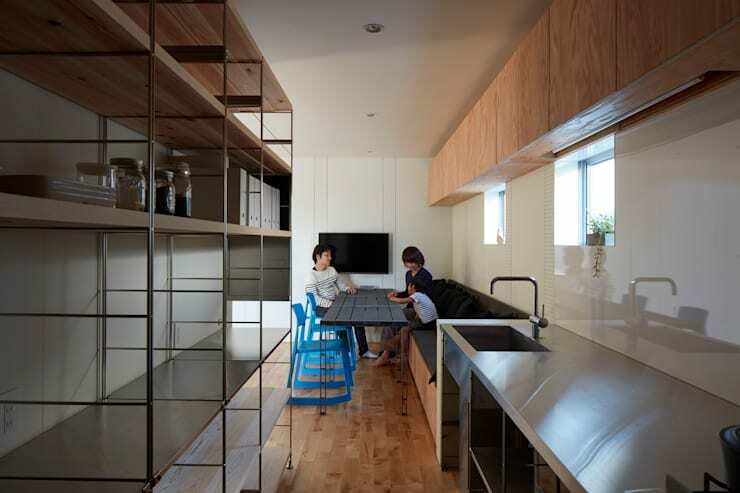 Aside from the expanses of wood, and some blue chairs, it is a fairly monochromatic kitchen. The bedrooms run behind the wall of storage units on the upper level. Each faces the exterior and has abundant light from the narrow band of windows. We love how the entrance to the master bedroom here is tucked away in the corner. This is a very private home with an unusual design and layout. 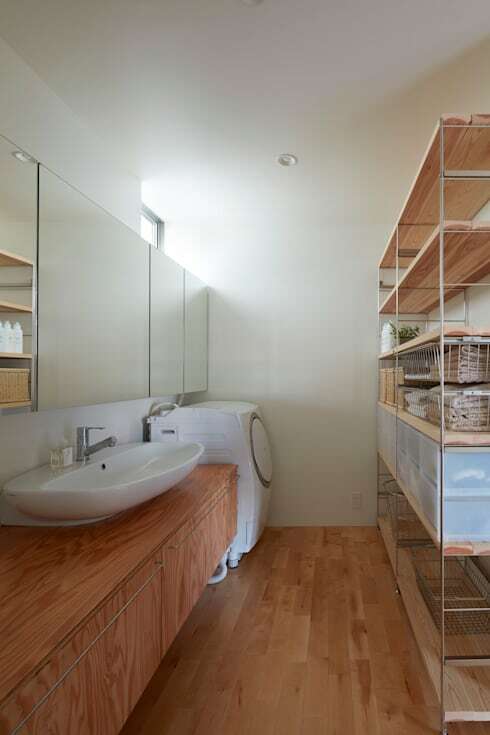 The wooden bathroom has been furnished with the same minimalist approach we have seen throughout the home. The colour scheme is composed of white, grey and natural wood and there is just one built-in cabinet that is raised off the floor. This, together with the long wall of mirrors gives the bathroom a very bright and light feel. Finally, note the lovely flood of sunlight coming from the high-set window. If you're looking for something a little different when it comes to home design, you'll love 11 totally unique kitchens. What do you think of having a basketball court in your home? Would you prefer another kind of sports pitch? What's your favourite sport? Tell us!